Dark Chocolate Hazelnut Fudge combines two of the world's great flavors ~ this homemade fudge is sophisticated, but quick and easy, and definitely giftable. Prepare an 8x8 baking pan by lightly spraying, and then lining with foil or parchment with longer overhanging edges so you can lift out the finished fudge for cutting. Put the nuts on a dry baking pan and toast for 15 minutes, tossing the nuts once during baking. Remove and allow to cool. Rub the nuts in a clean dishtowel to remove the skins before giving them a rough chop. Pour the condensed milk into a large microwavable bowl (or in a saucepan on the stove.) Don't bother to scrape every last bit out of the can. Microwave for 1 1/2 minutes on high power, or until the milk is bubbling. Add the chocolate to the bowl (off the heat if you are doing this on the stove) and stir to melt the chocolate. Stir in the Chocmeister spread, and the extract. Reheat the mixture in the microwave for 30 seconds if necessary to get everything melted and smooth. 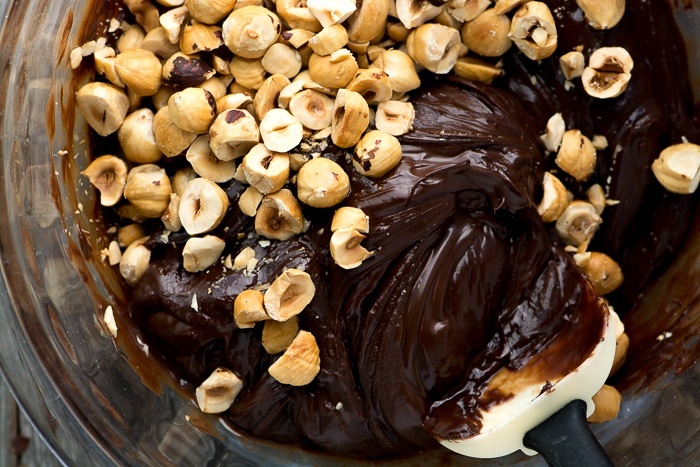 Spread the fudge in the prepared pan and even out. Refrigerate until firm. Dust the top with cocoa powder if you like, and cut into small squares.